The Architect of the Capitol (AOC) achieved a 30 percent total energy reduction by the end of fiscal year 2015 that was mandated by the Energy Independence and Security Act of 2007. The Senate Jurisdiction's efforts were integral to the AOC meeting its agency-wide goal. 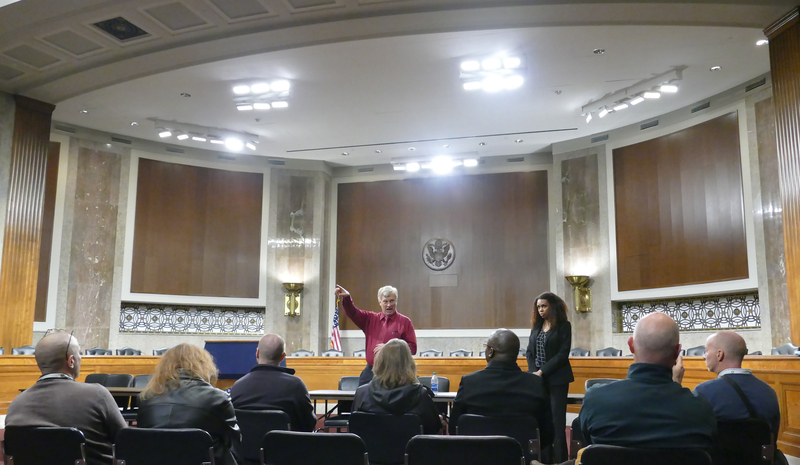 One of the key-energy saving initiatives in the Senate Office Buildings has been an emphasis on energy-efficient lighting, including retrofitting existing light fixtures to increase energy efficiency, installing LED lighting in Senate hearing rooms and expanding lighting control systems to maximize the effectiveness of lighting. Michael Shirven, Assistant Superintendent, and Alyssa Perron, Mechanical-Energy Engineer, explain hearing room lighting upgrades to visitors. Over the past several years, we have retrofitted nearly 44,000 lighting fixtures in the Senate buildings with high-efficiency lamps, ballasts, controls and reflectors – resulting in an estimated annual savings of nearly $750,000. Senate hearing rooms have been upgraded to more energy-efficient LED lights, which provides the bright, even illumination required in hearing rooms without the heat generated by traditional lighting for televised events. This change allows the Senate to save on both lighting and air conditioning costs. 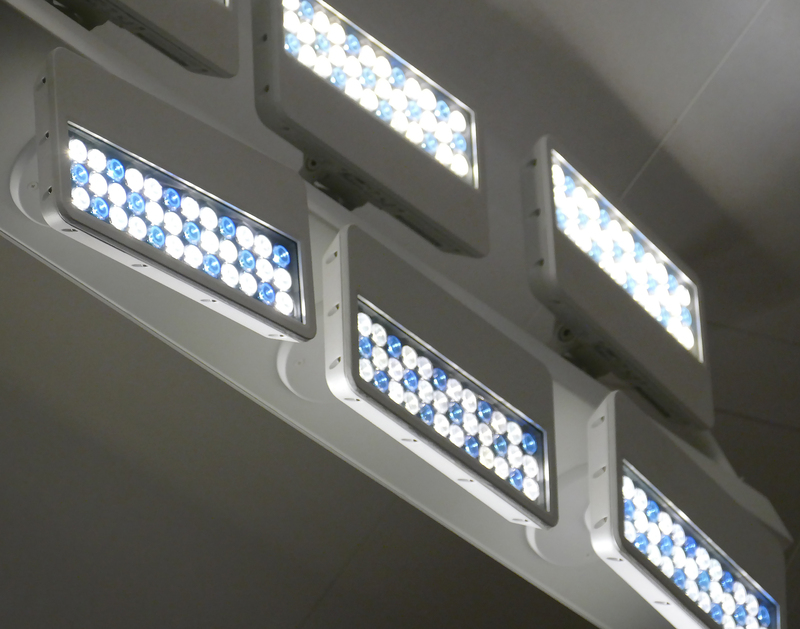 Expanded lighting control systems in the Senate buildings include daylight harvesting, dimmable ballasts and occupancy sensors to tailor lighting to various tasks and minimize unnecessary lighting use. In addition, the Senate Jurisdiction initiated a "Power Down" energy curtailment program to reduce electrical costs when the U.S. Senate is not in session for an extended period. While minimum light levels are maintained in all Senate buildings, decorative cove and architectural lighting is reduced, and Senate occupants are encouraged to turn off non-essential lights, electronics and other equipment. Overall energy consumption in the Senate has been greatly reduced, and energy savings from more energy-efficient lighting and lighting control systems represent a substantial portion of that savings.